Acoustica is a comprehensive audio editor for recording, editing, mixing and mastering. The intuitive user interface was designed with speed, accuracy and ease-of-use in mind and offers a large set of high quality processing tools to make your recordings sound the best. The consistent workflow simplifies your audio production work and batch processing, powerful audio restoration tools as well as Red Book compatible CD burning is also included. 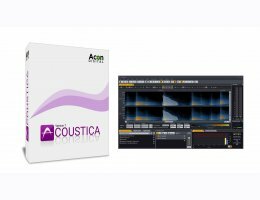 Acoustica 6 is available in three editions, the Standard Edition and the Premium Edition which supports 5.1 and 7.1 channel surround and includes extended processing tools and the same audio restoration algorithms as found in the Restoration Suite. Acoustica has user friendly and versatile tools for quality enhancement of old LP or tape recordings. Remove stationary noise like tape hiss or let Acoustica add high frequency harmonics to dull recordings. You can alter the timbre of your sound in almost any way possible with the six band full parametric equalizer or choose from a large number of audio effects ranging from lush reverbs to time stretching. If this is not enough, the support for DirectX plug-ins makes it easy to extend the program with third party audio processing tools.